General Overview By Bajoran tradition, the family name is mentioned first, so he is called Toral Myles. Myles is a very helpful person and can be quite selfless when it comes to helping others. Even if this means bending the rules a little bit. He was known to be impulsive and act out from his gut feelings, which is one character trait he has tried to work on, as he is very eager to go in for a career in Starfleet. This is also due to the fact that he was not accepted by other children and bullied, so he really wants to prove to him and others that he can make it. He is also an optimistic guy which is sometimes just put up not trying to accept failure - one of his greatest fears. On the one hand, being a cheerful and frank person, he does not have problems to socialize. On the other hand, it takes some time until he really calls someone a friend and he has only a handful of really close ones. If he got to know a person and likes her/him, he is a good sport. He really likes bantering with his friends. He likes sports as it helps him to work off stress and to clear his mind when something stresses him. Myles doesn't have many belongings as he has never really been attached to material things. This is reflected by his quarters. The room is usually quite plain and simple with only a handful of special decoration items. Most of the items he keeps in his room have a special meaning to him. Myles is religious and believes in the prophets, however, he could hardly be called a religious fanatic or overly pious. Hobbies & Interests He likes to play holo-novels in his free time. Apart from that, he tries to stay fit, so he likes jogging. This also helps him to get his head free again after a long day. Personal History Myles did not have a nice childhood as his family fled from Bajor because of the repressive Cardassian occupation of his home world. He spent his youth in several fugitive camps before his family found a home on a Federation colony world Anath III. When he was 8 years old, his father passed away due to old injuries caused by Cardassian mistreatment. Some more troubles came in primary school when some kids started teasing him because of his family history as fugitives. That really deeply hurt and afflicted him. It took him some time before he told his mother about it as he was afraid it might get worse when he started to talk about the bullies. Eventually, the problem could be solved and when he got older, he found some real friends. Nevertheless, this episode in his life still plays a major role for him, but he wouldn't admit it to anyone apart from his really close friends. A positive effect of that episode in his life is that he is a hard worker and tries to achieve the best possible outcome. When he turned 18, he decided to leave his second homeworld Anath III in order to join Starfleet Academy. He also had a relationship with a young human cadet that lasted until he graduated. He gave up the relationship then as he had to choose between his girlfriend and going in for a career. His academic performance was very good, which was mainly due to the fact that he worked very hard as he was also very eager to be one of the best. It was at that time that strong, black coffee became his favourite drink. After the Academy, Myles was assigned as operations officer to the USS Kalahari. It did not take long before he was moving up the ladder and became promoted to Lieutenant JG. 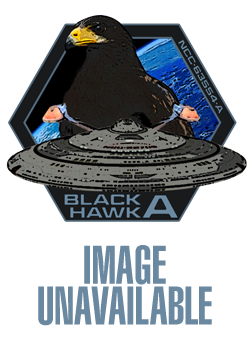 When he saw the chance to apply for Assistant Chief of Security on the USS Black Hawk, he went for it. Relationships He had a relationship with a human cadet at the Academy. However, he broke up with her at the end of the Academy.